Helping Mental Health Practitioners Deliver Culturally Competent Care. Based on rigorous research methods, CBMCS is a powerful diversity-training tool to take mental health practitioners from cultural sensitivity to cultural competence. 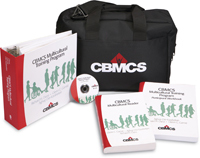 How is CBMCS different from other multicultural training programs? Includes the first empirically based assessment scale that is brief (21 items), accurate, and easy to administer. Allows mental health administrators and trainers the freedom to customize training as needed. Bridges the gap between research and practice by including step-by-step training modules along with the CBMCS Multicultural Reader, which includes 29 scholarly articles. Offers up to 32 continuing education credits. 3-Day Training Workshop - Click here for more information! Call 1.800.818.7243 to speak with a professional customer service representative. Copyright @ 2007 | CBMCS | SAGE Publications, Inc.